Choosing exterior home lights for your property can often be a difficult decision. Utilizing the right exterior lighting can significantly improve your home’s curb appeal, so it is important to ensure you cover all your bases. One of the best landscape lighting techniques homeowners can use to improve their curb appeal is uplighting. Uplighting can be used to highlight your home’s architectural elements, such as a bay window, molding, columns, latticework, or the overall façade. Uplights can be placed to highlight tall trees, ornamental shrubs, and other landscaping focal points as well. The most common types of uplights used for residential properties include sconces, spotlights, and globes. To help you get the most out of your uplighting, in this blog, we are going to share a few simple and effective ways to enhance your lighting scheme. Highlighting is the most common use of modern exterior uplighting. First, you will want to decide on which elements of your landscape design that you want to put emphasis on, whether its a tree, garden structures, or another element, and place a spotlight at the base of it. Position the light so that the entire structure is beautifully illuminated from beneath. Backlighting is perfect for creating a climactic silhouette of the structures in your yard. Choose a structure in your landscaping, such as a tree, plant, or statue, and aim your spotlight at the wall of your home behind it. The light will create an outline of the object, adding an element of drama to your landscape design. Wall washing is a great way to highlight the texture of exterior walls and create an ambient glow around your house. To create a wall washing scheme, place uplighting fixtures against the base of the walls of your home, pointed directly upward. This exterior lighting technique works similarly to how overhead lighting is used on the interior of a home. Wall washing brings attention to the large, smooth, vertical surface on the exterior of your home. It not only adds depth to architectural features, but it also provides true ambiance. Another way to add an appealing effect to your home’s exterior is by using uplighting to place a spotlight in front of a plant, structure, or another vantage point, angled towards the nearest wall. This will create a large, looming shadow that creates a moody tone. To enlarge the shadow, position the luminaire closer to the subject; to reduce it, simply move the fixture closer. 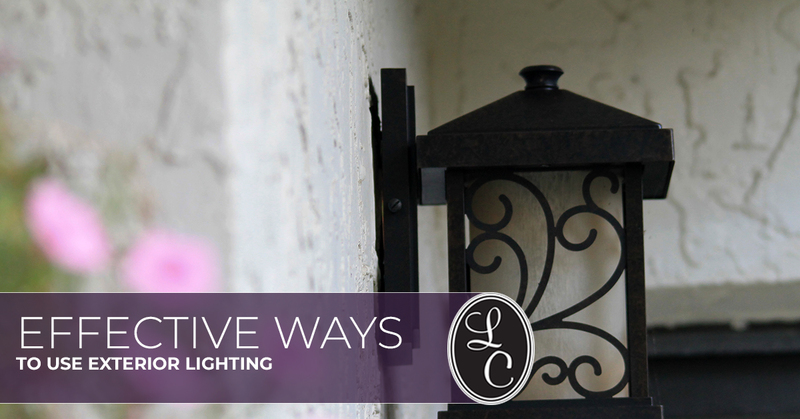 By using these popular techniques, you can use uplighting to help increase your home’s curb appeal. If you are looking for the quality landscape lighting in Trussville, AL and the surrounding areas, be sure to stop by Lighting Concepts Showroom. We have a wide selection of outdoor lighting and landscape lighting to choose from, as well as pre-arranged setups that demonstrate just how effective certain exterior lighting fixtures can be. Visit our lighting showroom or browse our selection of modern exterior lighting online!